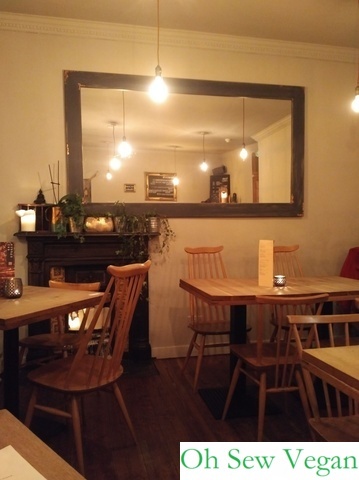 This wee pub and kitchen isn’t really made up to seem like an Asian restaurant with Asian decor, it’s really a comfortable and homey style pub with some interesting lampshades on the walls and a nice and inviting fireplace in the upstairs area where we were seated during our visit. 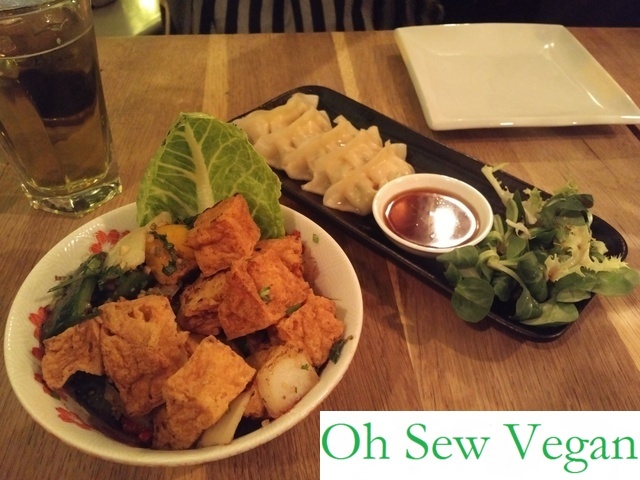 At the time I visited wee buddha with Emma from Vegan Edinburgh and her husband, they had a separate vegan menu for all the dishes that were suitable for vegans, but they couldn’t tell us which of the wines were vegan. 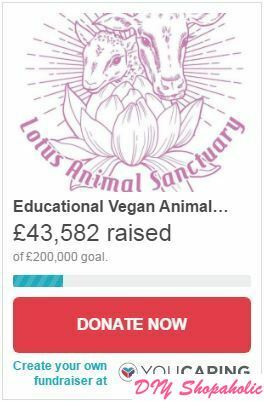 The staff however were very helpful and said they would look into it so they would have that information to hand for our next visit. There are quite a few dishes for each course and it was really hard to try and decide which one I wanted for dinner that night. We did try each other’s dishes, but I think I will definitely be going back to order other dishes myself because I enjoyed the food so much! 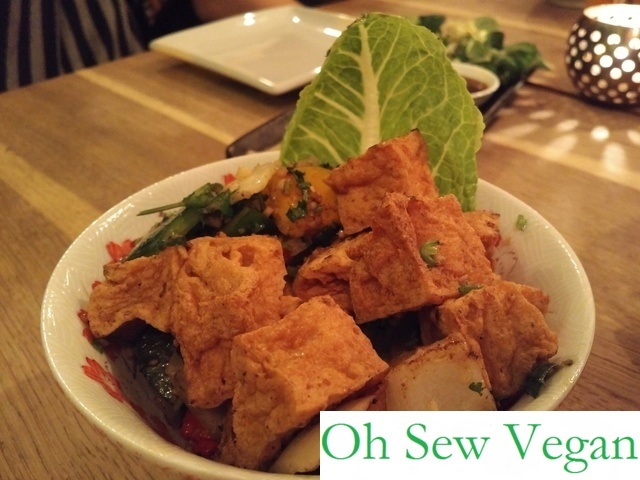 I absolutely loved the contrast between crispy outer skin and the silky tofu cubes covered in Chinese spices. It reminds me of the spicy tofu dish my family likes to make at home and what we sometimes order when we’re eating out at restaurants in Hong Kong. 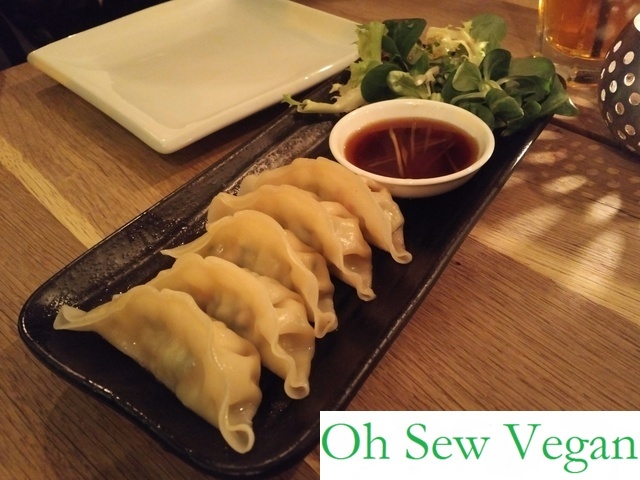 The vegetable gyoza (although a Japanese and not Chinese dish) is always a firm favourite of mine. I liked the way the dumplings have been cooked and then pan-seared to give a slight crisp to the base of the skin which is how such dishes should be cooked. I’ve not heard of Cantonese seasoned chips as seasoned chips isn’t really a Cantonese dish, but I imagine this is a dish that has been offered because of Scottish preferences for chips. 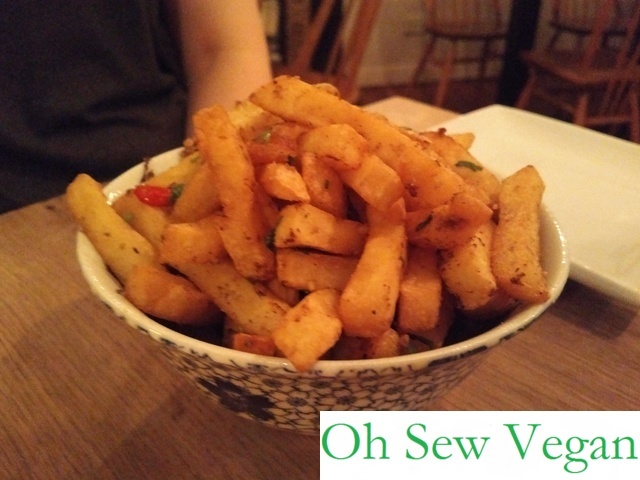 I enjoyed the spices and seasoning on the chips that you would normally eat plain deep fried. It adds another dimension to the fried and crispy taste of chips. I haven’t had Singapore fried noodles in ages and while this wasn’t exactly how I remembered it from when it was offered at my high school canteen, I still thoroughly enjoyed the stir fry vegetables tossed with vermicelli noodles. 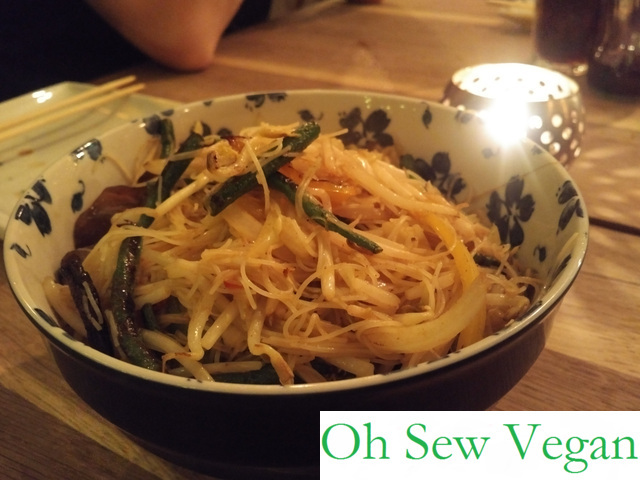 I’m always a bit wary about vegetables being overcooked, but I was really happy to find that the vegetables in my fried noodles were nice and crunchy, just how I like them. 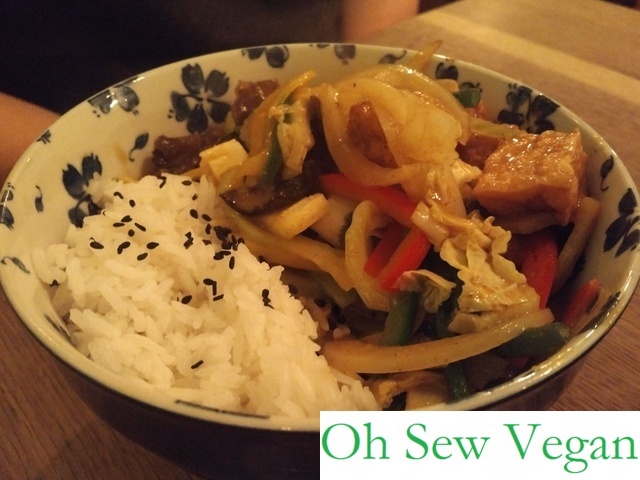 I was told that both the rice dishes were very nice and everyone enjoyed the meal immensely. 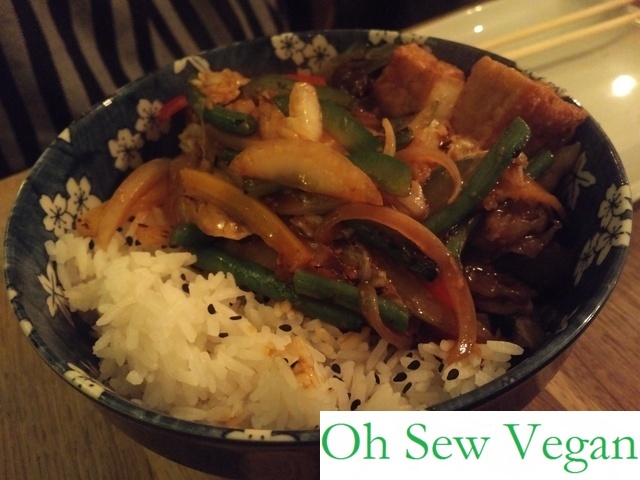 I was happy to have an Asian meal where I recognised most of the dishes and actually missed eating. 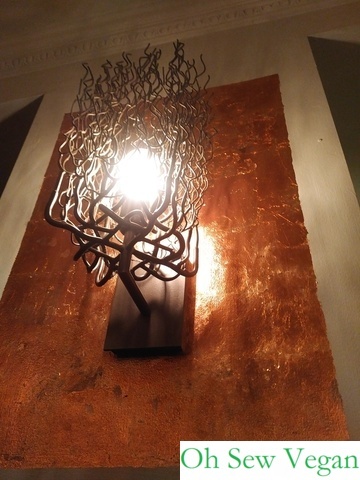 The pub and kitchen itself is really welcoming and the staff are very friendly and helpful. I can’t wait to come back for some more amazing food and to try some of the other dishes that sound just as good as the gyoza and crispy bean curd I got to try on this visit. You can find wee buddha at 2b Jamaica Street (just off Howe Street), EH3 6HH. For bookings and enquiries, call 0131 538 1215 or send them an e-mail. 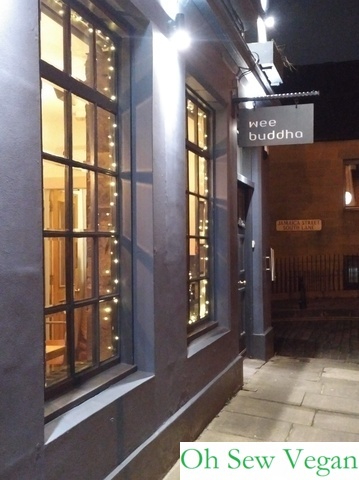 Have you been to wee buddha? What do you think about the food? Did you like or dislike any of the dishes?